Hacker attacks and malware infections can strike at any time in any business, although the risk increases with the number of users and computers on the network. Having constantly updated antimalware solutions is often not enough by itself. When a business falls victim to malicious software or other preventable security-related issues, the effects can be devastating. Information leak is also another issue which needs to be prevented whenever possible. Another problem faced by many businesses is spam email which costs businesses millions in wasted time, bandwidth and more. Preventing all of these problems in the simplest and most reliable way possible can be done using a unified threat management solution. The Protector is available in various different forms including both hardware and software solutions for businesses of any size. This solution provides many features to prevent security problems, intercept attempted information leak and greatly cut down in spam with its advanced email processing service. 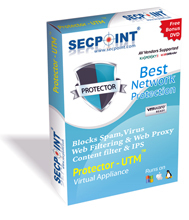 Learn more about the various versions available at http://www.secpoint.com/protector.html. This site does not contain serial number, crack, keygen The Protector: Unified Threat Management serial number : serial number is the simplest type of crack. A serial number(cdkey,product key,etc) is register the program as you may already know. a crack or keygen may contain harmful software. If you cannot find the exact version you want, just give it a try. for more information read .nfo/.txt/.diz file include in zipped file.